This isn’t a book – it’s a tome. Weighing in at 618 pages, this hefty hardback is a triumph for the author and the publisher. 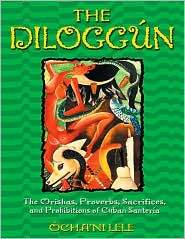 The author’s purpose was to record the detailed meanings and requirements of the 256 possible combinations of the diloggún oracle, and this goal has been achieved. This form of divination is specific to Lucumé (Santería). Readers unfamiliar with the practices of Santería should be aware that remedies in extreme cases include animal sacrifices. This book should be approached with an open mind and willingness to accept different religious traditions. The practices of Cuban Santeria will be difficult for most North Americans to fulfill unless they have access to ordained practitioners of this path as well as markets and shops where the necessary supplies can be obtained. Cultural appropriation isn’t polite and boundaries should be respected. Diloggún has much to recommend it as a powerful form of divinatory advice, but aleyos (clients who are non-practitioners of Lucumé) should approach this oracle with respect and caution. It isn’t like getting a horoscope or card reading! The divination is performed by tossing a set of 16 cowrie shells twice. The total of upright shells from each toss establishes the specific combination to be read by the diviner. Diloggún is a complex process of determining the client’s destiny, blessings or troubles. It there are troubles, it identifies remedies to avert the problems, along with taboos – things to avoid while the reading holds sway. Lucumé involves family, spiritual, and community participation that may also seem alien to neo-pagans. This religion had the same problems as those faced by witchcraft and solved it in different ways. Group involvement extends to diloggún. The client arrives for the reading with witnesses – spiritual godparents and others, plus the diviner’s assistant who writes down the results of the divination. An odu (numeric combination) may extend to everyone who attends the reading, and there can be dangers for the diviner as well. Some odu require immediate cleansings and offerings to propitiate angry gods. The session begins with a mojubando, a comprehensive prayer that prepares the way for the orishas to speak. Each odu is greeted by the names of its patron orishas. Once the cowrie shells are cast, the diviner uses a set of tools called ibó to perform a series of yes-no queries to determine the ceremonies, cleansings, remedies, or gifts required to ensure the luck of the odu, or to avert the troubles it forecasts. This is how diloggún differs from western methods of prediction – the oracle requires actions and efforts on the part of the client after the reading has been given. The client can ask questions and additional advice may be given by the witnesses. There can be horrible consequences if the requirements of the odu are unfulfilled. This is not an oracle for the faint of heart! The book begins with a history of Lucumé and the roots of diloggún. This is followed by detailed descriptions of the 256 possible combinations, the proverbs, stories, taboos, and proscribed remedies of each one. Some of the ebo (god gifts) include specific foods – complete recipes are given. At the end of the book, a much-needed glossary is given, along with suggested books to read and an index. Although most western readers won’t actually be able to perform the full requirements of either the oracle or the remedies, this book is well worth study by people interested in non-western forms of divination. The taboos and remedies are fascinating from a cultural and spiritual standpoint, and some of the god gifts and procedures may translate into one’s own practices. This book may be used for bibliomancy provided the orishas are held in high esteem by the reader. The orishas (or African loa) can be very kind and helpful to people outside of Santeria as long as their preferences and needs are respected and their taboos upheld. The effort that went into writing this book is only exceeded by the expertise required to write it. Ócha’ni Lele has produced a highly significant addition to the body of lore on Lucumé/Santería that is valuable for its comprehensive insights and its value to posterity in that religious tradition. Kudos to the editors and publisher of this book for accepting such a massive undertaking. Well done!